A constitutional amendment allowing same-day registration and voting passed by a wide margin in Maryland on Election Day despite strong opposition from registered Republicans. WASHINGTON, D.C. -- A constitutional amendment allowing same-day registration and voting passed by a wide margin in Maryland on Election Day despite strong opposition from registered Republicans. 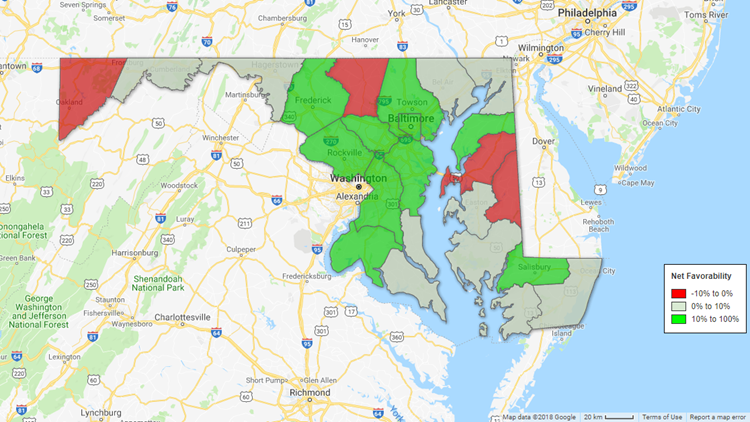 Maryland voters approved Ballot Question #2, “Same-Day Registration and Voting at the Precinct Polling Place on Election Day,” by a ratio of more than 2:1, with more than 1.3 million votes being cast in favor. The vote means Maryland will join 16 other states, and Washington, D.C., in allow voters to register and cast a ballot on Election Day. The state of Washington also approved same-day voting earlier this year, but has yet to implement it. Maryland’s same-day registration amendment was sponsored by District 39 Delegate Kirill Reznik (D-Montgomery County). It was opposed by Republican party leaders and added to this year’s ballot over their objections. Statewide, ballot measure approval received 67 percent of the vote and won all but four counties: Garrett, Carol, Queen Anne’s and Caroline. All four counties have a Republican majority among registered voters. A GOP majority didn’t guarantee a county would go “no” on the amendment. Allegany County, with roughly 61 percent of voters registered Republican, went 54 percent for the amendment. In Frederick County, where the GOP holds a slim majority, the ballot measure was approved by a 16-point margin. On the whole, though, even in Democrat-majority counties the number of Republican-registered voters was strongly correlated (R = 0.9586) with the number of "no" votes on Ballot Question #2. Those “no” votes were ultimately drowned out, particularly in lopsided localities like Prince George’s County – where those in favor of the amendment cast 237,577 votes compared to the opposition’s 42,597 – and the city of Baltimore, where “yes” votes were cast at nearly six-times the rate of “no” votes. Maryland Republicans did claim victory in another statewide race, however, with the re-election of Gov. Larry Hogan to a second term. Hogan was first elected in 2014 as just the second Republican in 50 years to reach the governor’s mansion. Not the be forgotten: Maryland voters were asked to weigh in on a second ballot question– the so-called “lockbox” amendment that would require casino revenues to be used to fund schools. It proved much less controversial, with 89 percent of all voters in favor. Jordan Fischer is a digital investigative reporter with the WUSA9 Special Assignment Unit. Follow him on Twitter at @JordanOnRecord.